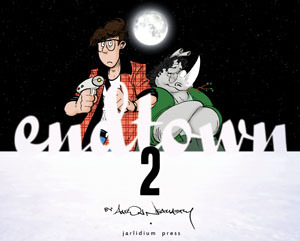 Endtown is an Ursa Major Award-nominated black & white web-comic by Aaron Neathery. “A mutagenic plague followed by a global war fought with disintegration weaponry has left much of the Earth a desert of fine powder, and what remains of humanity fragmented into humans, animal-like mutants and bloodthirsty monstrosities with lots of teeth. The surface, still teeming with the mutagenic virus, has become the domain of the dreaded Topsiders: Well-organized, technologically advanced, and heavily armed un-mutated humans sworn to exterminate mutations of any kind in order to clear the way for the eventual resurgence of a new, genetically clean humanity. Faced with annihilation, mutants and ‘impure’ humans have retreated into the depths of the planet to form communities and hope to win, or at least survive, what may prove to be mankind’s final war.” The strip continues weekly on Gocomics, and now Jarlidium Press have announced that the first two years of the comic will soon be released in two paperback volumes. Pre-orders have already closed, but the books will be available for general sale this June.